It is with great sadness that we must report that Brian Booth has passed away. His contribution to Oregon culture is difficult to overstate. 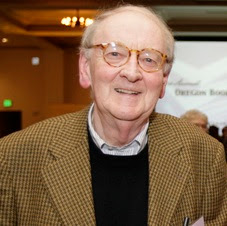 As one of our founders, he helped create the Oregon Book Awards & Fellowships, a program that has helped over 500 writers thrive over the past 25 years. Brian’s contributions were also significant in the legal community, and in our larger cultural life. He will be deeply missed. Thank you, Brian, for your tremendous love of Oregon and the many ways you showed it to us.